This entry was posted in International Law, International Relations, National, War Crimes by Hawaiian Kingdom. Bookmark the permalink. 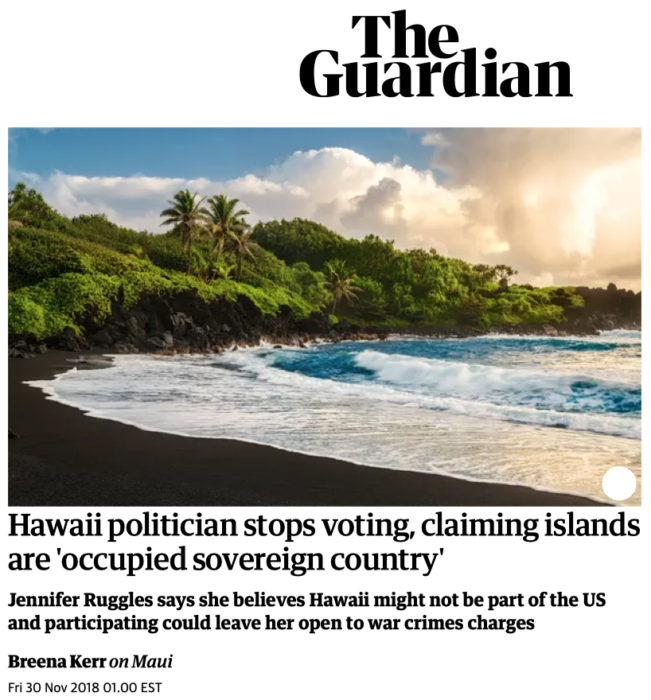 Perhaps the U.S. Department of State and State of Hawaii’s Governor gave no response to Ms. Ruggles concern that the Hawaiian Kingdom is a sovereign nation state in-continuity because they have chosen to perpetuate what the cabal had started in the Hawaiian Kingdom. They’re next! December 5, 2018, John Huber to reveal his findings. Widespread U.S. high level corruption! Global corruption! In order to MAGA, it needs to correct its Hewa with Hawaii. AGA would’ve seen that there is no substance (ipso facto to unilaterally annex the Hawaiian Kingdom) to support a political question. The global frequency is changing! Not knowing doesn’t hurt us but knowing helps us step in one accord. As the old saying goes, you don’t know what you don’t know until you know! As to whether or not anyone is ready to comprehend such data, only time will tell. However, the better informed we are the less likely to be duped! What is the story regarding John Huber??? John Huber was appointed to investigate the FBI and DOJ involving Carter Page. December 5, 2018, was targeted for him to disclose his findings. A good chance to see swamp creatures. But now it’s postponed due to #41 President George H.W. Bush’s death. Ironic that he died on November 30. 11+30=41, or deep state planned to postpone [D]5? Hard to get anykind of justice in a corrupt system. Not so hard now to see how Hawaii got tangled up. Syria has problems with the U.S. 30 people killed yesterday when U.S. dropped its bombs. Hmm, the U.S. pulled out of the U.N. Human Rights Council, its operations in Syria is neither authorized by the government of Bashar Assad nor the U.N Security Council, why are they over there? They have no authority in Hawaii, why are they still here? We’ll see if there is a counter to [D]5, perhaps another chance to see the house of cards fall! Dr. DeZayas seemed to have every professional right to write that letter with the letterhead, and certainly had the expertise. The fact that the organization is now speaking about “opinion”, should be a frightening prospect to all people of the world. It should t be based on the organization’s “opinion,” rather upon facts. ?? Corruption and manipulation to please the Master, until such time the Master is no longer Master. If the court is forced to accept the evidence presented as fact, does that mean that the previous Hawaii Supreme Court ruling, regarding proof of continuity has been met? Just curious. Thanks. What it means to me Noelani is that the previous Hawaii Supreme Court doesn’t exist legally. That’s how I see it and wish to believe. The issue here is their procedural rules and jurisdiction. It is not a lawfully constituted court without a bilateral treaty of cession. They truly are not ruling in accordance with the law of the land, Hawaiian Kingdom law. U.S. Federal and Domestic laws have no force here on our Aina of our Hawaiian Kingdom. They are confined to their continental borders according to the law. They are out of conformance with International law and the U.S. Constitution on this matter. Ko’u mana’o. Maika`i and mahalo for the reminder of the “where they come from” it relieves me of much of the manao`ino I have carried around with since my birth in ’42. One thing I did know how to do was hate them even when I lived with them and they most often do not know in large amount as we do. My anger has got me thrown in jail out of their court rulings and now out of ours. In the past I have petitioned a court hearing from the Lawful Hawaiian Government and found justice when just after I did not. No they are not lawfully constituted and when they are reminded of that they often back away. Have to keep standing up shouting “Uoki” and bring them also to what you have just said. Again Mahalo.